Summary : Orphan Jack Templar has no memory of his parents and only the smallest details from his Aunt Sophie about how they died. The day before Jack's fourteenth birthday, things start to change for him. At first it's great: A sudden new strength helps him defend his nose-picking friend "T-Rex" from the school bully, and even his crush, Cindy Adams, takes notice. But then a mysterious girl named Eva arrives and tells him two facts that will change his life forever. First, that he's the descendent of a long line of monster hunters and he's destined to be in the family business. Second, that there's a truce between man and monster that children are off-limits...until their fourteenth birthday! Jack has only one day before hundreds of monsters will descend on his little town of Sunnyvale and try to kill him. I absolutely love this book, I was deciding whether to give it a 5 star or 4 because the "warning" part at the beginning of the book and in a few places along the way. They got kind of draggy and some parts unnecessary, I was a little bit turned off by it at one point and almost wanted to put down the book, I'm glad I hang on, that's why it earned a 5 star. This book is packed with action and every minute you will be transported from one excitement to another heart racing danger, danger lurking around where Jack Templar & his friends have to fight off monsters, werewolf, trolls, zombies and harpies constantly. I don't remember reading books that has all of them in a book, quite an interesting mix of baddie guys. Even though its action at every turn the flow of the story is well paced where I was able to stop and catch my breath before I get caught up with another wave of excitement. I wasn't too comfortable with the detailed description on the way the main characters slayed the monsters I especially dislike the part where the monsters and creatures attacked Auntie Sophie but than again if it gets into me means the author did a good job with the description, although I think its too much information for 8YOs to handle. I am sure my 8YO boy, who is also an advance reader, will enjoy this book a lot but I would think this book will be more suitable for 13 YO & above, plus of course adults like me who love fantasy stories. 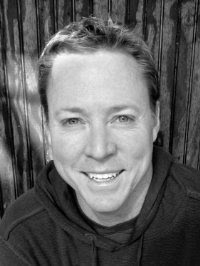 Jeff Gunhus is the author of the Middle Grade/YA series The Templar Chronicles. 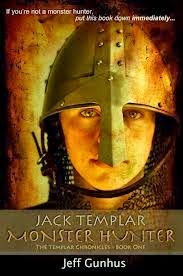 The first book, Jack Templar Monster Hunter, was written in an effort to get his reluctant reader eleven-year old son excited about reading. It worked and a new series was born. Jeff is also the co-CEO of a national company with over 4,000 employees that has been featured in national media for its unique opportunity for college students to learn entrepreneurial skills. He is the author of the motivational career guides No Parachute Required (Hyperion) and Wake Up Call (Seven Guns Press). After his experience with his son, he is passionate about helping parents reach young reluctant readers and is active in child literacy issues. As a father of five, he leads an active lifestyle in Maryland with his wife Nicole by trying to constantly keep up with his kids. In rare moments of quiet, he can be found in the back of the City Dock Cafe in Annapolis working on his next novel. Remarks : This post includes affiliated links.